The inspiration for this styled shoot came in the month of October while I was doing some shopping. There were Halloween decorations on one side and Christmas decorations on the other. I started wondering what would it be like to mix skulls in other occasions besides Halloween and my mind started working. I had been thinking of doing a styled shoot at the time and it was perfect timing because I got the chance to buy all the skulls that I needed for the shoot. I chose this particular style because I wanted to showcase that skulls can be beautiful. We see skulls and think of something scary and I wanted to flip that image into something that can be elegant. I chose the pastel color palette with gold to accentuate the elegance and simplicity that can be achieved. Anyone can create this style for their wedding! There are many great artists out there that create skulls out of glass, wood, carved in rock or gems and even carved out of antlers! 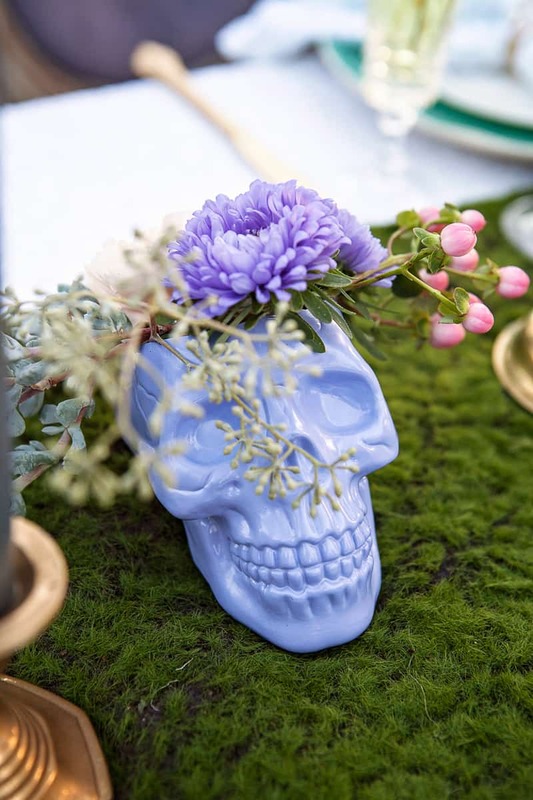 For this styled shoot I purchased some plastic skulls, cut a circle on the top and spray painted them in the color that I wanted so they could be used as centerpieces for the table. The small skulls were painted gold and added to the bouquet and boutonniere. We also had some bird skulls that were carved from antlers that were used on the napkin holders and they were a great way to add a different style of skull and texture to the style. The groom’s cake in the shape of a skull was a great way of adding to the theme and creating something unique! This style can be shifted to make skulls the center of the theme or sprinkle them around to create something interesting and out of the box. I love how the skull blends in this wedding inspiration, gorgeous! I also love her wedding dress! It’s very beautiful this kind of party, we love the mix of romantic things like flowers with skulls, very original! Love the detail, the colors, the mood. Very inspirational!